John Gibson Speedie was awarded the Medaille Militaire (France). 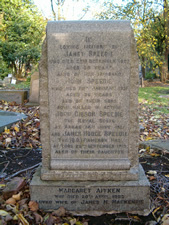 He was the son of John and Janet Speedie, 32 Polwarth Gardens. He died at the age of 25 and his name is on the WW1 memorial of St Michael’s Church. As yet, we do not have a photograph of John but show a photo of his gravestone in North Merchiston Cemetery.